Thames and Kosmos’ “Happy Atoms” combines physical and digital components for molecular exploration. This interesting experimental kit from Thames and Kosmos first came to our attention at The Toy Association’s annual Toy Fair this year. Happy Atoms is a safe and fun method of exploring the chemical foundations of the world around us. 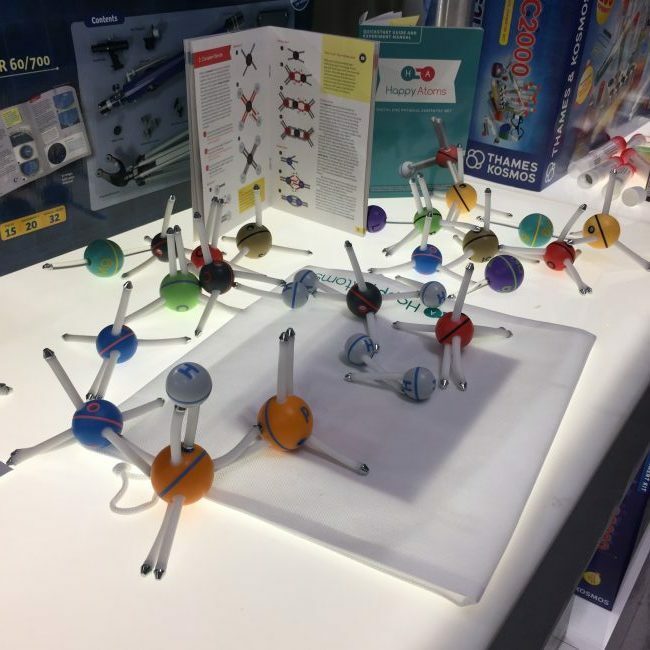 The game oriented analog and digital kit allows young scientists to build combinations of atoms and elements from a bag full of magnetic physical representations. Then they can explore the molecular properties of their creations via a downloadable application. It is perfect in a S.T.E.A.M. (Science, Technology, Engineering, Art & Math) classroom as well as at home on the kitchen table. Happy Atoms comes in a choice of three kit versions, the Complete Set, Introductory Set and the Educator’s Bundle. The App is a Free download. Adventure Publication’s Laurie Schacht and the Toy Insider team gave Holiday of Play attendees the lowdown on the latest & greatest modes of play. 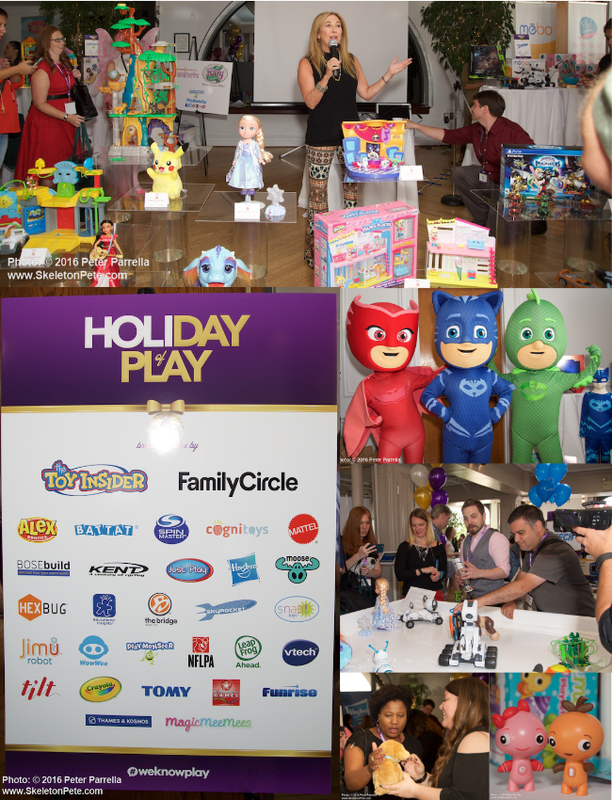 Once again it was our pleasure to join The Toy Insider team for the annual reveal of their choices for best toys for the holiday season lists. The HoliDAY of Play event highlights products in three categories, Hot 20 Toys, 12 Best Tech Toys, and 10 Best S.T.E.M. (Science, Technology, Engineering and Math) Toys. You probably know “Toy Insider Mom” Laurie Schacht from her numerous television appearances demonstrating the operation of those products. The Toy Insider 2016 Catalog can be found nested inside the current issue of Family Circle Magazine, and you can get comprehensive details on each item at the Toy Insider Website link above. Things to Make and Do…. There is probably no greater satisfaction for youngsters, really for anyone, than building something that works. That appeared to be the major theme this year at The HoliDAY of Play event. As we’ve seen in the past, from Lincoln Logs to LEGOS, the honing of dexterity skills, deciphering of instructions, assimilation of concepts, peaking of imagination and recovering from missteps, all make the final product a very personal thrill. The accomplishment makes the object all the more valuable to the builder.